The youngest member of a class of objects known as "X-ray binaries" has been found. X-ray binaries are systems with either a black hole or neutron star in orbit with a companion star like our Sun. Researchers found that the neutron star in Circinus X-1 is less than 4,600 years old, making the X-ray binary much younger than any other known in the Milky Way. Data from NASA's Chandra X-ray Observatory and the Australia Telescope Compact Array were used in this study. The youngest member of an important class of objects has been found using data from NASA's Chandra X-ray Observatory and the Australia Compact Telescope Array. 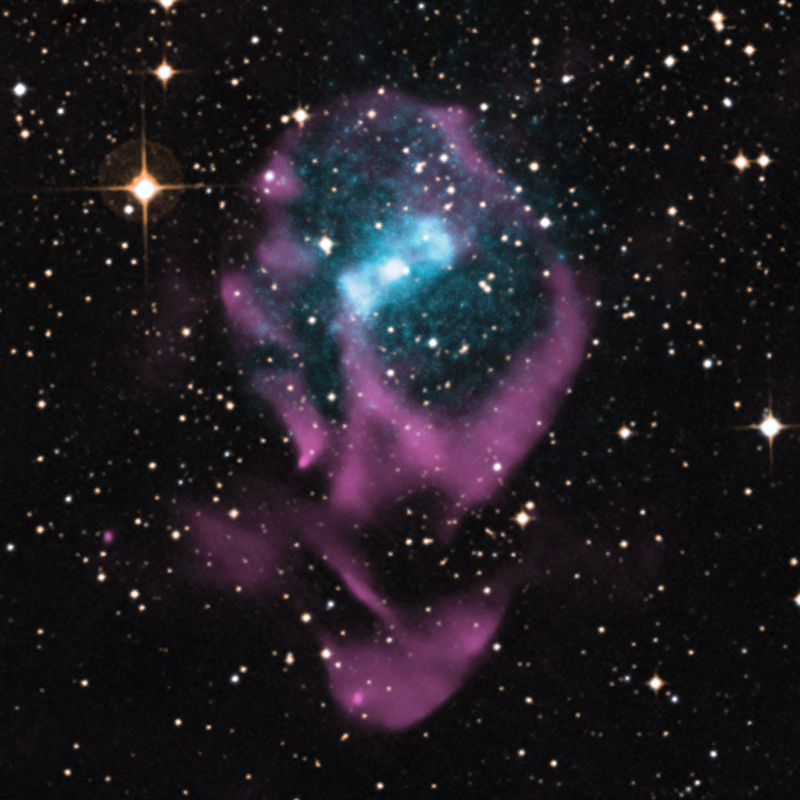 A composite image shows the X-rays in blue and radio emission in purple, which have been overlaid on an optical field of view from the Digitized Sky Survey. This discovery, described in the press release, allows scientists to study a critical phase after a supernova and the birth of a neutron star. Systems known as "X-ray binaries" are some of the brightest X-ray sources in the sky. They consist of either an ultra-dense star packed with neutrons --- a.k.a., a "neutron star" --- or a black hole that is paired with a normal star like the Sun. As these two objects orbit one another, the neutron star or black hole pulls material from the companion star onto it. A new study shows that the X-ray binary called Circinus X-1 is less than 4,600 years old, making it the youngest ever seen. Astronomers have detected hundreds of X-ray binaries throughout the Milky Way and other nearby galaxies. However, these older X-ray binaries only reveal information about what happens later in the evolution of these systems. Astronomers were able to determine the age of Circinus X-1 by examining material around the orbiting pair. While the source itself has been known for decades, the neutron star is usually so bright that the glare from its X-ray light overwhelms any faint emission surrounding it. The new Chandra data were obtained while the neutron star was in a very faint state, which meant it was dim enough for astronomers to detect the faint afterglow created by the supernova explosion plowing through the surrounding interstellar gas. This, combined with characteristics of the radio emission, allowed the researchers to pinpoint the age of the supernova remnant. In turn, this information reveals the age of the neutron star since they were formed at the same time. These results have been published in the December 4th issue of The Astrophysical Journal. In addition to those mentioned above, the other authors on this paper are Peter Jonker of the SRON Netherlands Institute for Space Research, Niel Brandt of Penn State University, Daniel Emilio Calvelo-Santos of the University of Southampton, Tasso Tzioumis of the Australia Telescope National Facility, Michael Nowak and Norbert Schultz of the Kavli Institute/MIT, Rudy Wijnands and Michiel van der Klis of the University of Amsterdam. References Heinz, S et al, 2013, ApJ accepted. Love your reports Keeps me humble and amazed. Keep up the brilliant work. Evey time I read an article like this I learn something new. This supernova must have occurred during the peak of the Egyptian empire and at a time that astronomical observers in China, India and some parts of Central America were beginning to take note of changes. Is this Supernova occurrence anywhere in the historical records? A neutron star and normal star binary pair in the Milky Way galaxy. 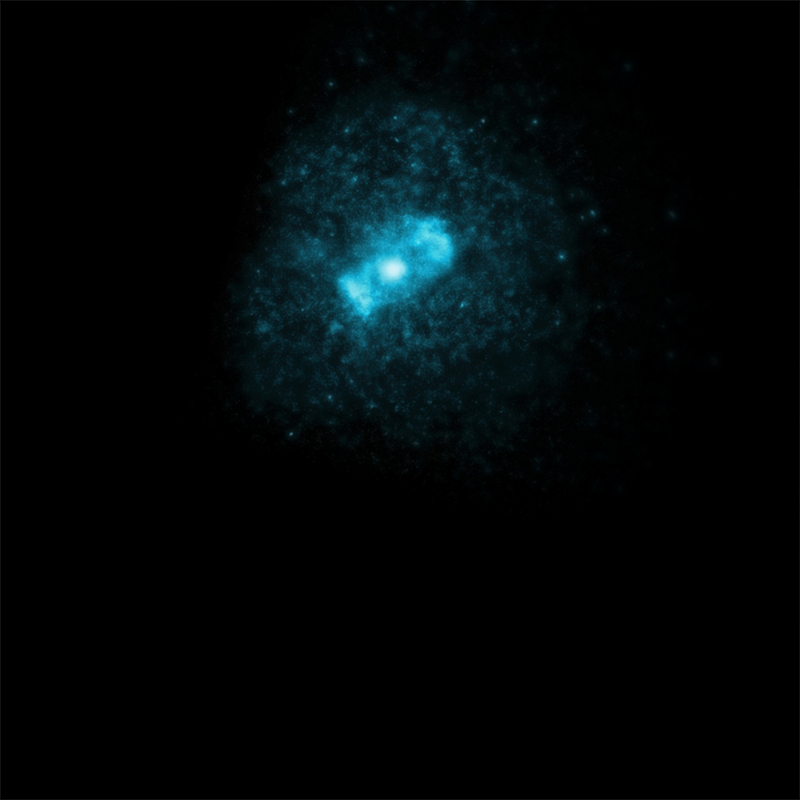 Combining X-rays from Chandra, radio from Australia Compact Telescope Array with optical field of view from the Digitized Sky Survey. About 76 light years across. X-rays are blue, optical red, green and blue and radio pink.